The New Year’s tradition is to start things off with a kiss and the NHL did their best, tapping former KISS guitarist Ace Frehley to perform at the 2018 Bridgestone NHL Winter Classic. “CALLING ROCK SOLDIERS!! Strike up the band, fire up your DVR’s and/or your winter coats… this just in,” begins a statement found on the legendary six-stringer’s Facebook page which detailed the news. Frehley now joins a performance cast which already included the Goo Goo Dolls during the first intermission as well as Bruce Springsteen’s E Street Band drummer Max Weinberg, who is billed under the Max Weinberg Quartet. 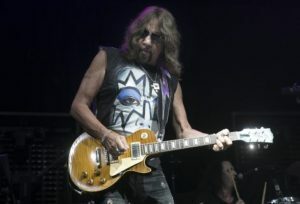 Frehley has been tapped to play his classic solo track “New York Groove” during the pre-game portion of the contest between the Buffalo Sabres and the home team New York Rangers at New York’s Citi Field. Meanwhile, Weinberg’s quartet will serve as the house band, playing songs voted on by fans with selections including AC/DC’s “Highway to Hell,” Bruce Springsteen’s “Born to Run,” Creedence Clearwater Revival’s “Fortunate Son” and the Ramones’ “I Wanna Be Sedated” as reported by WJBD. Earlier this year, rumors intensified regarding the Space Man’s return to the band he made his name in. After Frehley collaborated with Paul Stanley and Gene Simmons independently for his solo material and took the stage with Simmons, fans began connecting the dots, assuming a reunion was inevitable. Both Stanley and Simmons rejected the notion and Frehley didn’t do much himself to tip the scales of optimism, putting the chances of him rejoining KISS at an even 50-50 shot.